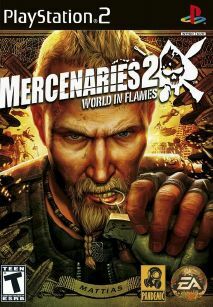 Mercenaries 2: World in Flames is an explosive open-world action game set in a massive, highly reactive, war-torn world. A power-hungry tyrant messes with Venezuela’s oil supply, sparking an invasion that turns the country into a warzone. But for you, international crisis is all upside: You are a mercenary, and you profit from chaos. Mercenaries 2 features a slew of potential clients, all willing to pay you to do their dirty work. Dirty deeds, done for exorbitant fees. These are world powers with deep pockets, deep grudges, and enough arms and ammo to start World War III. This is your kind of environment. Mercenaries 2 features the latest and most dangerous in civilian and military tech, everything from shiny new sports cars, to the future-tech satellite-guided bunker-busting mini-nuke. Tanks, APCs, boats, luxury automobiles – you name it, you can have it delivered to you in real time. And if you run out of cash you can always ‘acquire’ the gear you need in the field. If you see it, you can buy it, steal it, or blow the living crap out of it. Play your own way, or play with the help of a friend in the new cooperative multiplayer mode. You are not a soldier. You don’t have to play by anyone’s rules. You have your own code: you will fulfill the terms of the contract, no matter what. Not everyone in the world of Mercenaries is as honorable. Everyone will try and screw you, given the chance. They think they can get away with it, because they don’t know rule #1: EVERYBODY PAYS.